Other photos: Photo 1, Photo 2, Photo 3, Manufacturer Provided Image: Arrangements, Photo 5, Photo 6, Photo 7, Photo 8, Photo 9, Photo 10, Photo 11, Photo 12, Photo 13, Photo 14, Photo 15, Photo 16, Photo 17, Photo 18, Photo 19, Photo 20, Photo 21, Photo 22, Photo 23, Photo 24, Photo 25, Photo 26, Photo 27, Photo 28, Photo 29, Photo 30, Photo 31, Photo 32, Photo 33, Photo 34, Photo 35, Photo 36, Photo 37, Photo 38, Photo 39, Photo 40, Photo 41, Photo 42, Photo 43, Photo 44, Photo 45, Photo 46, Photo 47, Photo 48, Photo 49, Photo 50, Photo 51, Photo 52, Photo 53, Photo 54, Photo 55, Photo 56, Photo 57, Photo 58, Photo 59, Photo 60, Photo 61, Photo 62, Photo 63, Photo 64, Photo 65, Photo 66, Photo 67, Photo 68, Photo 69, Photo 70, Photo 71, Photo 72, Photo 73, Photo 74, Photo 75. The 68c has proven to be one of the most comfortable boats in its class. The convex hull will give you a smooth ride even on high seas, especially on this enclosed version, where you will be riding in the comfort of air condition, and the ability to hold a conversation without the engine roar. Given the 68's displacement, Hatteras' reputation for building a stout boat is clearly intact. While other production builders have fiddled with lightweight structures, Hatteras has always favored practical and proven methods. The 68's hull bottom is solid fiberglass supported by a fiberglass stringer system and Divinycell foam-cored bulkheads. Coring is used to stiffen the hullsides, decks and superstructure. Like all Hatteras yachts, the 68's molded gelcoat finish is prepped and painted in a state-of-the-art coating facility. One of the many key features is the draft on this 68, while others in its size are over 6', the Hatteras tunnel design makes the draft on the 68c a 5'3". The 68 is so full of smart engineering details that it's easy to forget that her primary purpose is fishing, until you look around her cockpit—all 195 square feet of it, thanks to that generous beam. 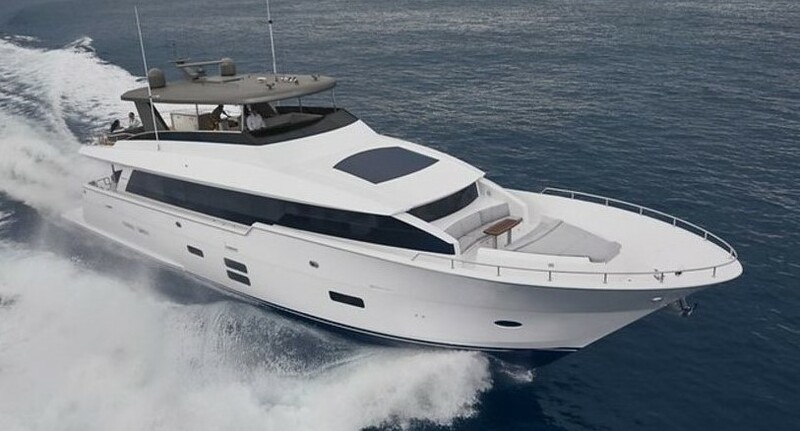 Step aboard this 68, and you will be mesmerized with all the space and comfort.